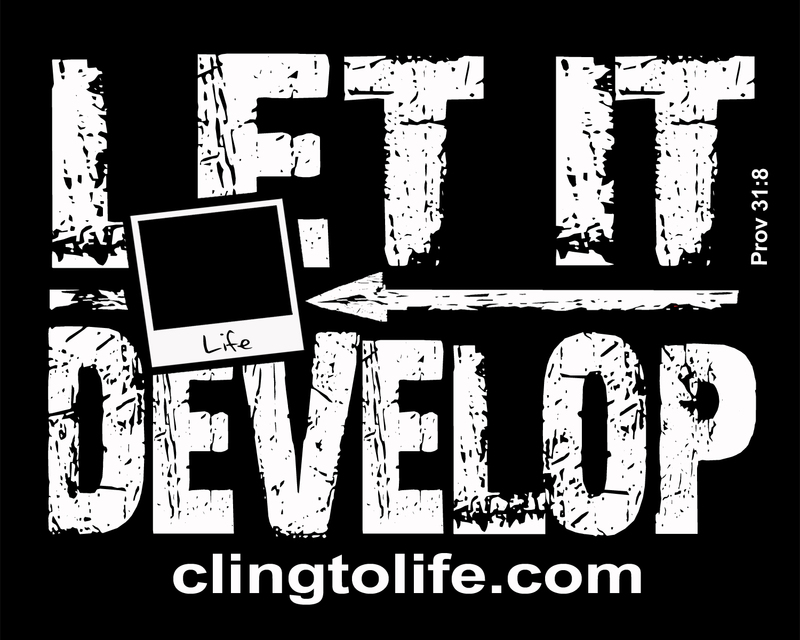 “Let it Develop” clings are exclusively available through pregnancy centers . 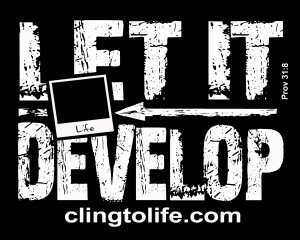 If you are an individual and you would like to join the Cling-to-Life Campaign, contact your LOCAL Pregnancy Center. If you are a Pregnancy Center and you would like to join the Cling-to-Life Campaign follow the ‘Directors Only’ link. You will need a password to enter this part of the site. If you are a director and you do not have one please email us and we will provide you with one. This sticker’s simple, but curious statement “Let It Develop” will peak the interest of others and motivate them to visit a website to discover its beautiful meaning. Since vehicle stickers reflect the individuality and values of the driver and family, the “Cling to Life” campaign is a trendy way to make a powerful statement in your support of the sanctity of human life and the work of pregnancy centers. Every day these centers serve to protect the lives of the unborn and offer hope and encouragement to the woman facing an unplanned pregnancy. Please display this on YOUR car. It is a simple way for those who are pro-life to become proactive. "80% of women who abort say they wouldn't have if they had adequate support"